Ford Cologne factory workers are among the most efficient in Europe. 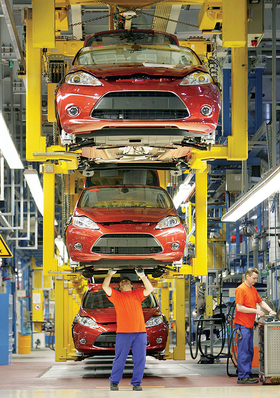 A team of 70 engineers spent their weekends getting the Ford factory in Cologne ready for the new Fiesta. When other people were having coffee and cakes with their mothers-in-law, we were at the factory, said Karl Anton, operations manager here. Volume production of the small car began in August, but preparations began in late December 2006. With the factory working a three-shift system from 6:45 a.m. on Monday morning until 6:45 a.m. on Saturday, weekends were the only free time to prepare for the new Fiesta. Normally you lose quite a few cars when you have a traditional ramp up, but we didnt want to do that, Anton told Automotive News Europe. On each Saturday, the production line was handed over to suppliers to look at the changes they needed to make to the parts they supply. Fords own engineers also would spend 14 hours building the new equipment and testing the line. On Sunday afternoon, the line was switched back to the old Fiesta ready for Monday morning. Cologne plant employees received a total of about 50,000 hours of training. Some of the training was done off the line on a static car. Three months before full production began, a new Fiesta was integrated into the normal production line to enable production line workers to get to know the new model. Product engineers also got to work on the car in final assembly, enabling them to spot opportunities for greater efficiencies. As a result, very little Fiesta production -- fewer than 600 units -- was lost when full production began on August 14.